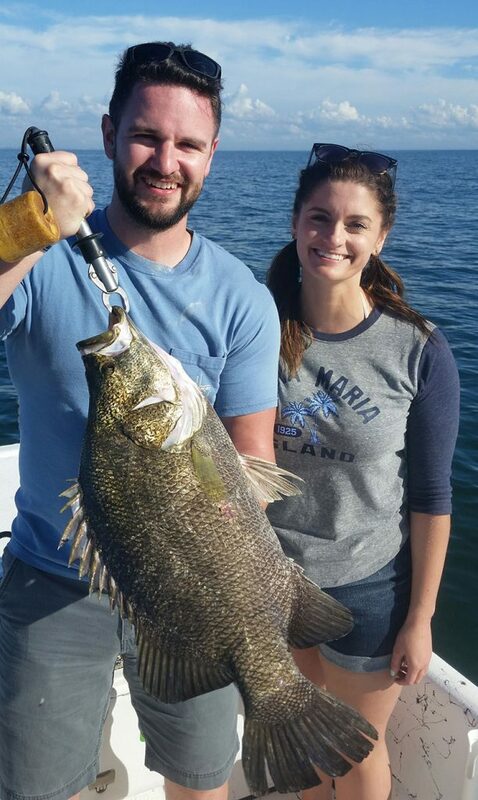 Thomas Hickey and wife Danielle, visiting from Columbus, Ohio, teamed up Jan. 10 on this nice 12-pound tripletail a few miles off of Egmont Key. It was hiding under a patch of floating grass when it ate the large shrimp on Hickey’s hook. The family also caught plenty of snapper, sheepshead and grunts for dinner on their charter trip with Capt. Aaron Lowman. 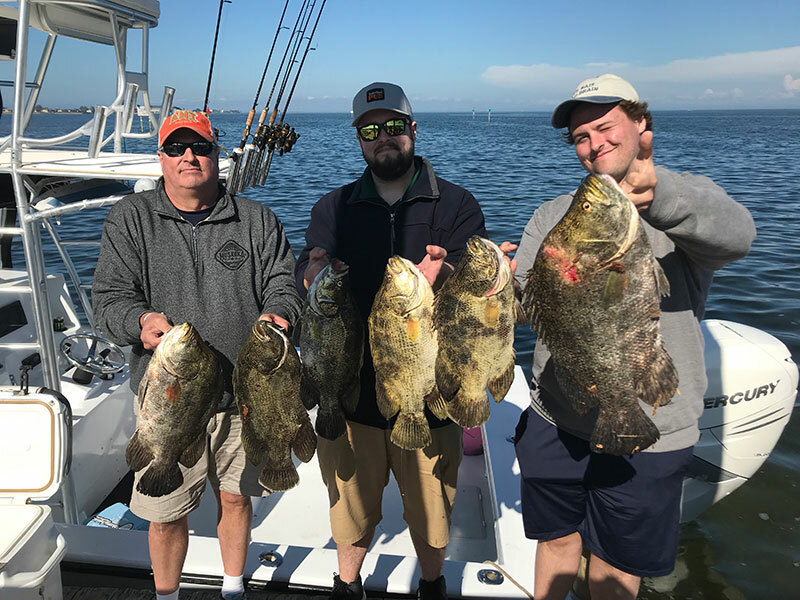 Nick, Adam, and Rob Seal of Burlington, Ontario, show off their limit of tripletail Jan. 10, caught on live, select shrimp as bait on a charter trip with Capt. David White. 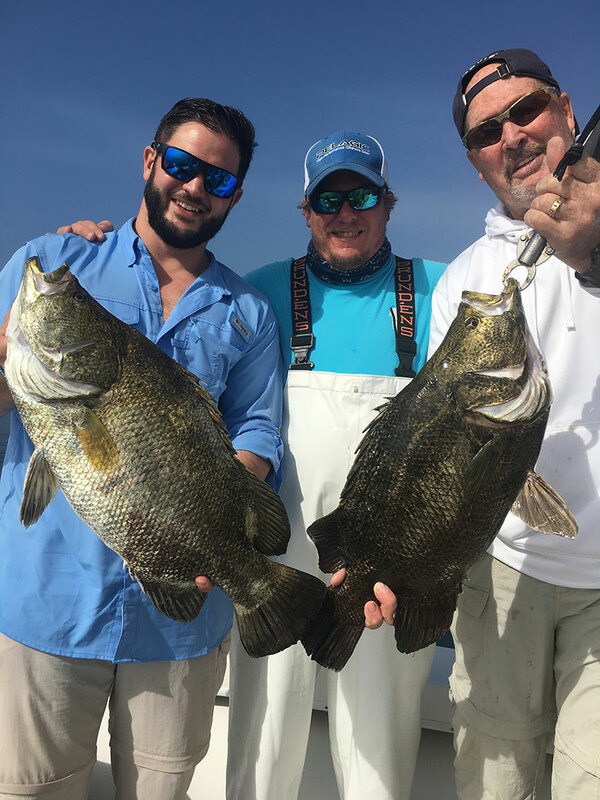 Scott Willis, left, and dad, Mark, both of Bradenton, show off their tripletails from a Jan. 11 guided fishing trip with Capt. Danny Stasny, center, of Southernaire Fishing Charters. 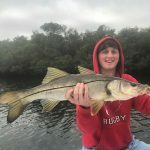 Fishing around the barrage of cold fronts we are experiencing can be quite good — if you pick the right days. You must pick your days. And you can pick your fish. But the days have to be the calm ones between cold fronts. A lot of action is occurring, but it’s got to be calm in order to have a good experience out there. 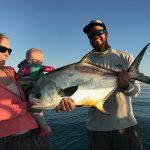 Big amberjack are being caught around the wrecks offshore, while hogfish, grunts and snappers are being taken around the ledges and artificial reefs. Don’t forget about tripletail. As elusive and confusing as these fish can be to figure out, they can be simple to catch when you find them. Speaking of tripletail, on my recent Southernaire charter, I found myself floating in and out of patches of thick fog as I patrolled one of the trap lines, giving everything a mysterious and eerie feeling. But let me tell you, the tripletail were in abundance. I couldn’t believe it. So, there I was, up in the tower cruising the trap line and literally stopping at almost every buoy. 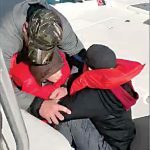 Mark Willis and his son Scott, both of Bradenton, and their friend Chip Legassey of Harbour Isle on Perico Island were busy baiting up as we slowly approached the fish. Scott cast to the first fish, a 12-pounder, which immediately hit the bait. Scott tightened up and set the hook, letting the fish make a straight shot toward the boat. It spit the hook and slowly swam back to its buoy. “Cast another bait in there!” I hollered down from up in the tower. Scott did just that and the fish hit again. We were cheering as Scott fought the fish to the boat. Next, it was Chip’s turn. Same deal. We approached the buoy. Chip placed the bait perfectly in front of the fish and it ate the shrimp without hesitation. Chip quickly set the hook and cranked the tripletail boatside. This one fell just short of the 15-inch minimum and we gently put it back and watched it swim away. The third fish, another big one — coming in at 10 pounds — was hooked by Mark. This stubborn fish took a few tries before it would take the bait. In fact, Mark cast so close to the buoy, the shrimp was flush against the trap line. “I’m hung up,” Mark said. “Let it sit. See if he’ll eat it off the line for you,” I replied. And sure enough, that’s what happened. Drag peeled off Mark’s reel as the “crappie on steroids” turned sideways trying to get away. Persistently, Mark fought the fish until it was finally boat side, photographed, and in the cooler. After a day like that, everyone was stoked. Instead of seeing double though, I guess you could say we were seeing triple. Capt. 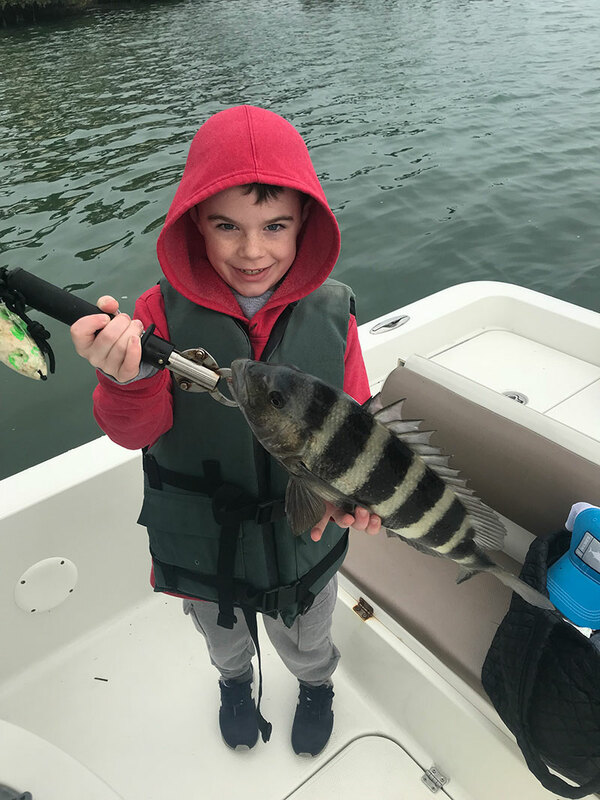 Warren Girle is working charters inshore on the recent cold, windy days and, despite the conditions, he’s doing quite well. Targeting sheltered areas such as residential canals where seawalls and docks hold fish is proving to be an excellent choice for Girle’s anglers. Sheepshead, black drum and redfish are being caught frequently with a few flounder and catch-and-release snook in the mix, with live shrimp as the preferred bait. On calmer days when venturing into Sarasota Bay is more welcoming, Girle is finding exceptional numbers of spotted seatrout and rallies of 50-60 fish. Capt. Aaron Lowman is guiding anglers in the back bays, canals and creeks for shelter from the cold and wind. By doing so, he’s running across sheepshead and redfish, both indulging themselves on live shrimp. Casting around docks, rocks and bars is proving sufficient to locate the fish. Along the beaches, Lowman is finding pompano and plenty of whiting hungry for shrimp. On calm days, while in the Gulf of Mexico, tripletail are at the top of the menu. Capt. David White of Anna Maria Charters took advantage of a couple of calm days to venture offshore. The predominant bite — when you can get out there — is grunts, snappers, hogfish and tripletail, all readily taking live shrimp. Moving into the bays, pompano and spotted seatrout are dominating the bite for White. Both species are showing interest in small jigs garnished with a piece of fresh-cut shrimp — especially the pompano. Jim Malfese at the Rod & Reel Pier is seeing redfish being caught in respectable sizes and numbers. Slot- and over-slot reds are being caught by anglers willing to chill and wait for a bite. Live shrimp cast under the pier deck is yielding results. Mixed in with the redfish are sheepshead, black drum and flounder. On the calmer days, when the weather is warmer, bouncing a shrimp-tipped jig along the shore adjacent to the pier is resulting in a look from a pompano or two. Capt. Jason Stock is patrolling offshore wrecks when the weather permits, where persistence pays off, especially for amberjack. Casting top-water plugs such as surface poppers in these areas is attracting AJs — the largest weighing in at 18 pounds. Yes, that’s right. Talk about some sore arms for the unsuspecting angler who reeled that one in. Aside from gigantic amberjack, goliath grouper are on Stock’s offshore agenda. Fish in the 100- to 200-pound range are the norm. Go big or go home, cappy. 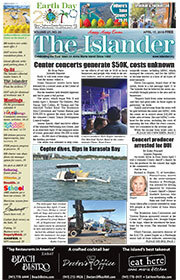 For more of the past week’s fishing photos, go to www.islander.org.